I was startled to find this image while doing some ‘surfing” today. It brings back some difficult memories of hard lessons learned. This was a comprehensive sketch for one of three strategy board games FASA was developing in the middle of their RPG run. Paramount had just announced modification to their licensing agreements; up to this point West End Games also had a licensed Trek game line but were limited to strategy board games but that policy was being changed. From that point on the various licenses were non-exclusive – the holders could develop board games, RPGS or whatever they thought would sell. I got a panic call from Jordan: they needed comps for proposed games to go in the new catalog – but there was no budget to cover the cost. As at this point we were all still “friends” I did the work on spec, with the understanding that I’d get top dollar when the actual game covers were commissioned. They never were…and it was at about this time that I noticed a distinct “coolness” radiating from Van Buren Avenue in Chicago and the whole “we’re in this together” atmosphere slowly faded away. It was a sad lesson: sometimes you can’t be as nice to people as you’d like to be. Sometimes people take it as a sign of weakness. Sometimes people shoot themselves in the foot. This entry was posted in Art, Life, Star Trek by David R. Deitrick. Bookmark the permalink. Is there a rough draft of these books existing somewhere, is it possible to get a copy, how much would that cost? Many years later there are still a number of followers that share your disappointment at the loss of this particular game module that promised so much. Thank you for sharing your view of what happened. never saw a manuscript – just a short verbal description over the phone (as was usually the case). I don’t think anything became of them. Thank you so much for your response I can’t tell you how happy I am to talk to you. Sorry to ask so many questions but I am intently curious to hear what actually happened at FASA, did you do any other work for this module or was it just the Klingon theater ad, if so do you still have that work? I would really really love to see it or hear what you envisioned if things had turned out different. Also I read somewhere Gene Roddenberry had a personal hand at taking away Fasa’s license, do you know if this is true? Again thank you so much for writing me back. When the Trek game started out in 1983 there wasn’t much oversight by Paramount – in fact the first half dozen covers I did I signed my name with a copyright bullet and they let it go without requiring a change. STIV and ST:TNG changed everything- Paramount’s licensing department mushroomed and they started micro-managing everything. GR got a lot more clout too. He was always trying to downplay the military aspects of Trek (which is a glaring contradiction) and he thought that FASA’s interpretation was too militaristic and focused too much on combat and violence. I don’t know if he was a factor in the overall license but I do know that he personally killed the Star Fleet Marines supplement, which was sad because a top-notch artist did uniform designs and cover for it that never got used. Thanks for filling me in and I was also sad about the star fleet marine and ground forces manuals not being released. 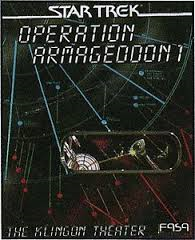 Did you make other covers for the operation Armageddon books, such as one for the road to the stars Romulan incursion book or have a larger printing of the Klingon theatre ad? If so is it something you could show or possibly even sell? I hope I am not asking too much and really appreciate your time and stories. Thank you for your responses and I hope to hear from you again. when I inquired about them later on. All the Trek work I did is long gone. I occasionally do commissions (marker renderings of characters) in fact I did a red-tunic movie era Vulcan last month – a female Vulcan SF officer for a friend in the Bay area. Who are Jordan and Ross? The Vulcan character sounds intriguing do you have that posted somewhere on your site? Also this is some great information and may be of some interest to a Star Trek Chat board I belong to. This board is specially devoted to the Fasa Starship Tactical Combat simulator game at http://www.ststcsolda.space/ and they will probably love to hear from the artist that was there. Do you mind if I share our conversation? I will understand perfectly if you say no. Thank you again for everything.